I would like to welcome you to the 2019 Duxbury Football season. It is time to begin our preparation for the upcoming season. I know, you’ll ask “Why so early”. The deadline for providing our registration numbers to the OCYFL is May 15th. I have opened registration on our website, so please take a few minutes to complete your registration. If you wish, you may delay payment until July 15th, but we would really appreciate it if you could register before May. For those of you who do not know me, I would like to introduce myself, as well as the other DDF&C Board Members. I am the President of Duxbury Youth Football and Cheer for the 3rd year. This year, our Treasurer is Jay Barberia, and Secretary is Alex Marconi. Jen Carley is back as our Cheer Coordinator. In addition, Dave Maimaron, Pat Smith, Will Jamieson, Mike Bearce, Harry Taylor, Brian Guinan and Gerard Murray round out our Board of Directors. Duxbury Dragons Football & Cheer is completely run by volunteers, and as always year we have big shoes to fill. If you would like to help in any capacity, please reach out to me or one of the other Board Members. You may want to sit on our Board of Directors, help manage our equipment, run the concession stand, assist with fundraising, manage the apparel or be a volunteer coordinator or maybe even a coach. All of these jobs can be shared, and you’ll have an opportunity to work with some good people, and have some fun while supporting our organization. I would also like to ask you to spread the word about Duxbury Football. I believe we have one of the premier youth football programs in the OCYFL. DHS Coach Maimaron has been instrumental in providing instruction to all of our coaching staff on proper drills and technique. We have lead the way in adapting to the changing environment around youth sports by partnering with such programs as the USA Football HeadsUp program to educate all coaches and parents in best practices and procedures. 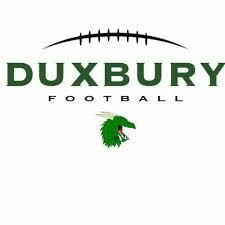 We are planning a couple of informational events for parents to demonstrate what Duxbury Football is all about, so watch for more information coming on that. Thank You for your time, and your participation in our program. If you have any questions, always feel free to reach out to myself or any of our Board Members.